The Saturday-Sunday storm event has continued to modify with settlement of the snowpack. Boot penetration in this slab is commonly 6-7 inches, whereas ski and snowmobile penetration is 3-4 inches. Additional consolidation of this layer is expected this weekend as temperatures rise to above freezing day and night. The persistent slab problem above the Thanksgiving rain crust is gaining strength. In both the East and West Cabinets, recent stress tests of this layer have failed to produce a shear. This column when picked up and dropped on the pit floor does not break on any shear plane. We have not "written off" concerns associated with this persistent slab. Persistent slabs are notorious for being tricky to forecast and manage. 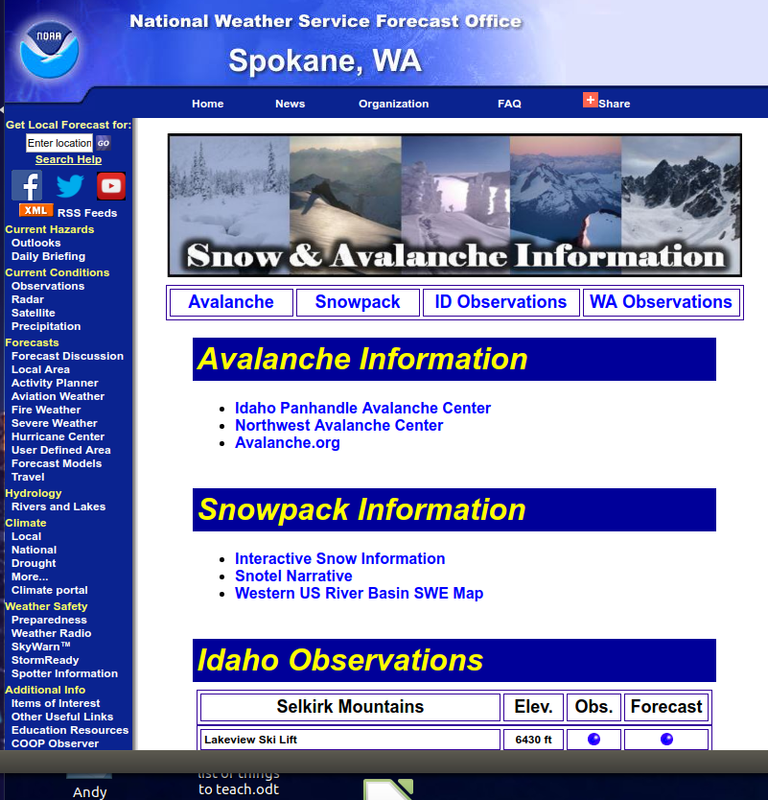 In the Kootenai Region, we did not build wind slabs or pillows associated with the high winds of last Sunday or Monday. The soft snow available for wind transport was capped by rain and melt-freeze crusts. Although our snowpack is littered with needles and branches, little snow was transported. Significant snowpack settlement started last Sunday and accelerated Monday. This settlement continues through today, but at a reduced rate due to cooler temperatures. Weather forecasts lead us to believe that another round of significant snowpack settlement is in order for this weekend with temperatures above freezing day and night. Little additional storm loading is forecasted and winds would transport snow if any were available. We expect hazard to stabilize unless significant thawing of the snowpack results from elevated temperatures. Thawing producing free water in a snowpack is an obvious sign of instability. Be ever mindful of warm temperatures or rain on snow this weekend in your back country travels. Sunday January 18th, marked the one year anniversary of the tragic death of Cameron Goins. Cam was participating in a David Thompson SAR avalanche training exercise at the time. Cam left a huge hole in our hearts. Yesterday, I visited Benning Mountain in the West Cabinet Range. At 6000 feet elevation I found 63 inches of snowpack on a steep north aspect. The top inch is very soft snow comprised mostly of graupel. Below this a knife hard double sandwich layer of 2 inch depth. Below these crusts are a soft 4 finger 3 inch thick layer and a 1 finger 6 inch layer. All of the above rests on a 1 inch knife hard rain crust. This was the base layer (blue card marks base layer) for all the soft slab releases Sunday morning. A 19 inch thick and 14 inch thick pencil hard layers sit atop of the Thanksgiving knife hard rain crust of 5 inch thickness. The bottom 12 inches is loosely consolidated snow that continues to react to temperature gradients above that drive water vapor near the ground to rise in the snowpack. Extended Column Tests resulted in a fracture with no propagation 12 inches from the surface (ECTN13). This is exactly where all of Sunday's natural releases occured. Since the Tuesday, January 20th advisory, weather in the Kootenai region has been cool and dry. 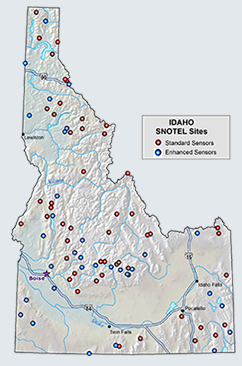 All SNOTEL sites registered below freezing temperatures for the period, with upper teens being the coldest readings. SWE increases were minimal at +0.0 - 0.1 inches with 1-2 inches of snowpack settlement. Today's weather at 1100 hours on Benning Mountain in the West Cabinet Range at 6000 feet elevation was thin overcast cloud cover, very light snowfall, 5-7 mph west ridgetop winds, and 25ºF. There is approximately an inch of 2-4 mm graupel available for wind transport. Forecasted weather is for 80-95% cloud cover through Saturday with temperatures rising to above freezing (39-43ºF) by Saturday. Winds will be out of the southwest at 7-16 mph. Chance of snow is 70-90% but with minimal accumulations (1-4 inches) through Saturday.